A good filling healthy snack, that is all what we need sometimes instead of turning to the usual potato crisps or other fast foods. I made this simple recipe for Avocado Toast after a conversation with one of my cousin sisters. She had it whilst on holiday in Australia. When I was growing up in Malawi we had two avocado trees in our back garden and we used to eat them mashed with sugar and milk as a dessert, it was so wonderful. I also had quite a lot of it after my son was born, it was a very good way to boost the vitamins into the body and have a nutritious snack while lactating. Apart from eating them, we also used to use them for beauty treatments, like applying mashed avocado in our hair to act as an excellent conditioner. Back then we didn’t realise the benefits of Avocados. Here’s a good article about avocados for keeping your hair healthy. 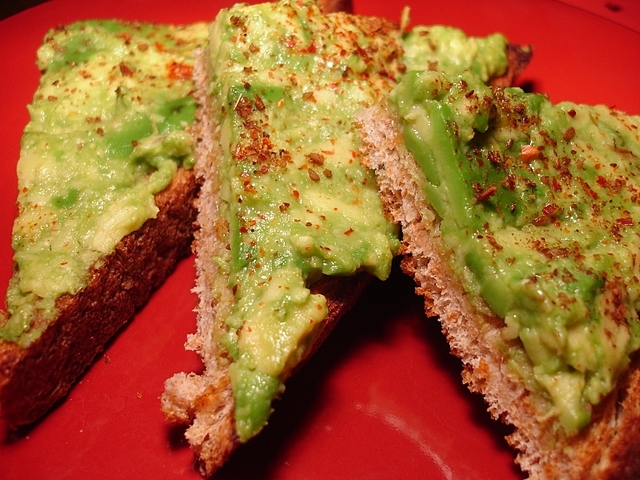 1) Toast the bread, while that is cooking peel, stone and mash the avocado in a large bowl. 2) To the mashed avocado add the lemon juice and salt to taste and mix well. Spread the mixture on the toast and then sprinkle the ground cumin and chilli flakes. You can then either place under the grill for a quick minute or two, or just eat as they are. This looks delicious – I am quite partial to avocado and sliced tomato on toast with black pepper (and sometimes a little peanut butter) – have never put it under the grill before but this makes it sound like a good idea!